Biktrix Juggernaut the cheapest commercial BB02/Efatbike on the market. There was recently a very successful kickstarter campaign for the ‘Biktrix Juggernaut‘ that raised $69,000 by selling sub $2000 electric fatbikes to the masses ($1500 USD for early adopters). The Juggernaut is tricked out with Alivio shifters and Tektro brakes (Aquila line – similar to the Avid BB7), although several people opted for hydraulic brakes (HDC 330). From the size of the front chainring looks to be a bike mostly for on-road riding with a claimed weight of 60lbs with battery. To get in the sub 60lb territory with an inexpensive e-fatbike like this is actually quite a feat. The frame is custom-built aluminum with a 68mm bottom bracket that fits the stock BBS02 like a glove. The description also says ‘BBS02 with custom firmware’ which I assume means they just programmed the units to 25Amps, although they may have made other changes to the firmware as well like setting 100% throttle on all PAS levels including 0. Although the kickstarter shows the C961 display, I am told that the actual bike will ship with the C963 display which is my personal favorite. My wish list for this bike would be a smaller chainring in front, a more comfy seat (ouch) and no kickstand. I have been told that “The seat is actually quite comfy. It’s like sitting on a couch!” That being said this successful kickstarter campaign proves that there is some pent-up demand for an affordable BBS02 electric fatbike for the masses. The retail on this bike will be in the $2000 USD range once it is available to the public. 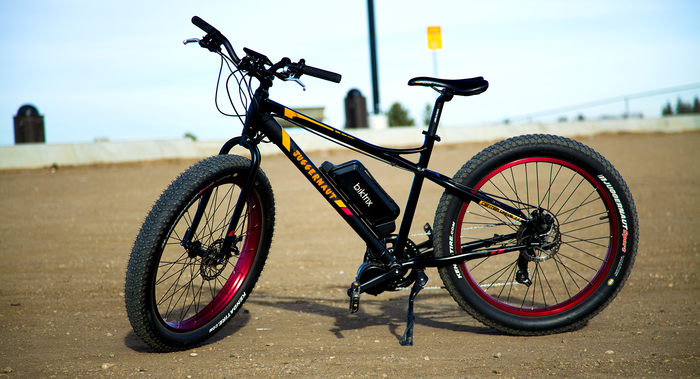 The Biktrix website is here for more info and to order one (shipping in March). I contacted Biktrix via email a couple of weeks ago and asked what method they had used to get the BBS02 kit to fit on the Juggernaught. They answered my email in 5 minutes. Note their comment about the fact that they may have more news about a BBS02 kit to fit a 100mm BB in a month. Hello, I see that you sell your Mid Drive bike kit separately and say that it will fit 90% of other bikes. Fat Tire bikes have a much wider “Bottom Bracket” (100mm BB) than other bikes (68mm), I can not tell if your kit will actually fit other Fat Tire bikes, or your Fat Tire Juggernaut has been modified in some way so that your mid drive kit call be used on it. I already have a Fat Tire bike with a 100mm Bottom Bracket, and would like to know if your kit will fit my existing bike. Yes, you are right – Standard fat bikes have wider bracket than regular bikes. Our bike – Juggernaut was designed to have a standard size bottom bracket (68 mm). We are testing our fat bike mid motor kit to suit bikes with 100 mm bottom bracket. I will more news for you next month. Go to know, I suspected they were running a 68mm bottom bracket. I suspect that it is offset so that they can clear the tire, although it might not be necessary since their rims look like they are 50mm not 80 or 100 like most fatbikes. Going from a 80mm to a 50mm rim saves almost .5 inch on the width of the tire.